Whether you want to kick the cable company to the curb or want to stream Netflix, Amazon, Spotify and other services on your TV, Android TV is a solution you should consider. Android TV takes the eponymous operating system to the big(ger) screen. It's not a television but, instead, an operating system for your TV, gaming console or set-top box. Think of it like having a smart TV with built-in streaming and gaming apps, or like using a device such as the Roku or Apple TV. 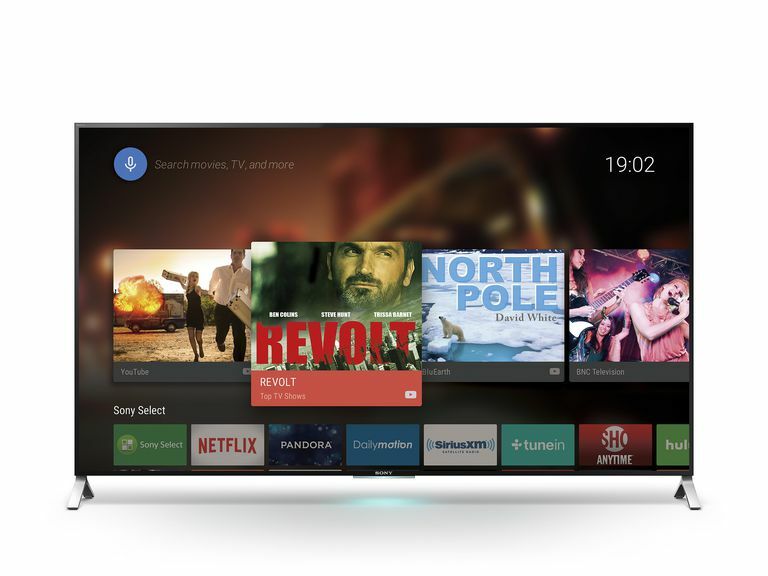 You can find Android TV in some Sharp and Sony TVs, but you don't have to buy a brand new set. There are also a handful of set-top boxes from NVidia and others that can smarten up your TV. In addition to streaming videos and music, you can also play games on Android TV. The platform supports multiplayer gaming for up to four, and when playing on your own, you can resume game progress from smartphone to tablet to the TV. A handful of compatible gaming accessories are available from NVidia and Razor. Android TV also includes access to the Google Play Store, where you can download streaming apps, such as Netflix, Hulu, and HBO GO, as well as gaming apps, such as Grand Theft Auto and Crossy Road, and publications, such as CNET and The Economist. Be sure to select auto-update apps in settings, so your apps are never out of date. Android TV also supports video chats, such as Google Hangouts. Finally, you can use the Google Cast mobile app to send content, including movies, TV shows, music, games, and sports, from your Android, iOS, Mac, Windows or Chromebook device to your TV. Google Cast works similarly to the Chromecast, which is a subscription service that enables you to send content from your smartphone to your TV for $35 per month. Searching for content on smart TVs and set-top boxes can also be tedious. It's hard to keep track of which TV show is streaming where or which movies Netflix has on offer. Luckily, Google Assistant integrates with the Android TV platform. If your device doesn't have Google Assistant integration, check for a system update by going into Settings. Press the microphone on your remote to set up the Assistant. Once you've installed the Assistant, you can talk directly to your TV or device by saying "OK Google" or pressing the mic on your remote: you can search by name (such as Ghostbusters) or description (documentaries about national parks; movies starring Matt Damon, etc.). You can also use it to get weather information or search for anything on the web, such as sports scores or whether an actor has won an Oscar. If you've tried to log into apps on your TV, then you know the frustrating of typing with your remote control. It's torture. Google's Smart Lock can act as a password manager for supported apps, including Netflix, and many of Google's own. To use it, go to your smartphone or tablet's Chrome app settings and enable "offer to save your web passwords" and "auto sign-in." You can also opt-out of this feature by clicking "never" when the browser offers to save a password. To undo this, you can visit Chrome settings and view all of your saved passwords and the "never saved" section. While Android compatible televisions and set-top boxes come with remotes, you can also use your smartphone to navigate and play games. Just download the Android TV Remote Control app in the Google Play store. You can choose between a d-pad (four-way control) or touchpad (swipe) interface. From each, you can easily access voice search. The Wear OS (formerly Android Wear) version of the app lets you swipe between screens using your wearable's watch face. Some streaming apps allow what's called background listening, which lets you listen to audio from a news or other type of broadcast or music while browsing titles or deciding what to watch next. Android TV has a feature called Daydream, which is a screensaver that, by default, turns on after five minutes of inactivity. Daydream displays vibrant photo slideshows to prevent static screen images from burning into your TV screen. You can go into the Android TV settings and change the amount of time before Daydream turns on as well as adjust when the Android TV goes to sleep. Smart TVs and set-top boxes are an excellent option for cord-cutters who've had enough of cable companies. Just keep in mind that some apps require a cable subscription, such as HBO, which initially offered HBO GO only to current subscribers. It now has a companion app called HBO NOW that's open to all users. Check out app requirements before canceling your subscription. The Chromecast device mentioned above plugs into your TV; it lets you stream content from your smartphone to your TV. You can also use it to mirror any content from your smartphone screen, including websites, images, games, and entertainment. Other devices include the Apple TV, Roku, and the Amazon Fire TV. The Roku comes in several versions, including set-top boxes and streaming sticks, each at different price points for different budgets. Apple TV is the only one that will play your iTunes content. Likewise, the Amazon Fire TV or TV stick is good if Amazon is your jam. The Roku has an Amazon app built in, for streaming Prime content. If you want to watch Amazon programming on the Apple TV or via Android TV, you'll have to mirror your mobile device using Airplay or the casting feature in your browser.